The worldwide obesity epidemic suggests that while it has become (perhaps too) easy to eat in response to hunger (or to a host of other stimulations), the global problem facing our contemporaries today is to stop eating before over-consumption has occurred. Actually, science has established that biological mechanisms exist to stop eating and/or suppress its occurrence, even in situations of plentiful access to palatable food. One such mechanism is satiety. The scientific exploration of satiety developed from physiologically-oriented studies. Enlightening pioneer works have illustrated concepts such as homeostasis and energy regulation that are still at the centre of our understanding of food intake control today. Over time, the contribution of sensory, psychological, and socio-cultural factors has been recognised. 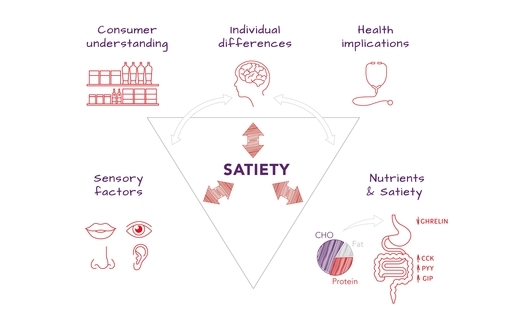 Recent scientific developments, notably in the field of brain imaging, now allow the research of satiety mechanisms to scrutinise brain structures and functions directly while increasingly sensitive tools monitor the periphery of the organism, from the mouth to the gut. Once eating has started, various psycho-biological mechanisms come into play to bring the eating episode to an end. Those mechanisms, also very well investigated in scientific works, are those of satiation. After the end of an eating episode, people or animals stop eating for some time before hunger returns. This period without eating, and the psycho-biological mechanisms that support it, are what we call satiety. The duration and intensity of satiety are essential factors in body weight control, as evidenced in laboratory animals with ad libitum access to food: satiety is the crucial mechanism that allows the adequate adjustment of energy intake to energy needs and therefore prevents overeating. The situation in human consumers is clearly more complicated than in animals confined to the very restricted environment of a laboratory cage. Fortunately! Sensory influences are richer, psychological mechanisms are more complex, social and cultural determinants are powerful. Critically, human consumers are exposed to the highly palatable, energy-dense foods present in their affluent “obesogenic” environment. Under those conditions, it is important to understand satiety mechanisms and, possibly, to optimize them and facilitate body weight control. This is what the present article will address."